I was at Dell’s giant user event on Wednesday to see what the computer company had to say about the internet of things. Much of the talk onstage was a rehash of how connected devices must talk to a server, which is good for Dell. Also, these devices need security (good for Dell’s RSA business) and data analytics. I was hoping Dell executives would delve into how distributed computing might truly become more distributed, with devices that do more talking to each other as opposed to back to a server or even one of Dell’s popular gateway boxes. That didn’t happen. Dell’s Project Fuse wants to open source software to handle the needs found in the second row from the bottom. Bringing data into a database, sending immediate commands back if needed, normalizing metadata and device provisioning. But I did uncover something worthwhile at the event. I meet with Jason Shepherd, director of IoT strategy and partnerships with Dell, who told me about its efforts to bring a modular set of building blocks to the industrial internet. It’s called Project Fuse, and Dell plans to make the effort open source. 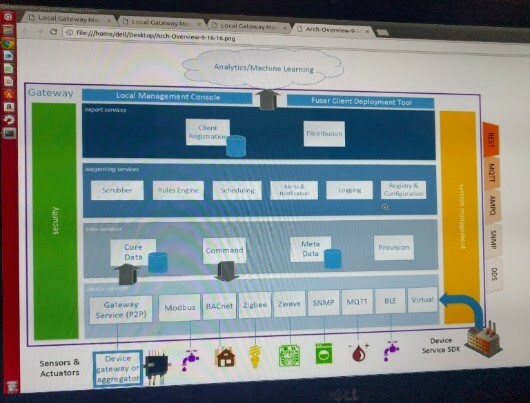 Dell is working with 30 other “big name” companies that Shepherd didn’t name to create a layer of technologies that will sit between the many different messaging protocols used by today’s sensor networks and the cloud and analytics layer (see photo). To me, this looks like it could cause problems for some of the middleware software vendors that currently do a lot of the heavy lifting for clients trying to integrate various systems, but Shepherd says some of them are on board because a platform like Project Fuse means they don’t have to build each client’s integration from scratch. From my perspective, that’s where a lot of companies think the margins are, but if we want the industrial internet to ever become something that can scale it has to be cheaper. A modular, open software stack can help accomplish that. Making a core tech stack reusable and open source does make it cheaper. ForDell, this means it can sell more of its established server, data analytics and security products. Less certain is where this fits in with other open source gateway efforts such as Project Kura, or the newly announced Project Kapua from the Eclipse Foundation. Project Kura is an open source code base that is designed to sit on gateway boxes and help organize the transfer of information between sensors and the cloud, one of the key functions that Project Fuse seems to be taking care of as well. Shepherd says the Dell effort is more “flexible” for Dell’s enterprise customers. Dell plans to rename Fuse (that’s its code name) and announce the project later this year with some sort of beta version launching in the first quarter of 2017. Keep an eye on this one. Did you like this story? Want more? Sign up for Stacey Knows Things, a newsletter covering the internet of things, to get this essay and more. I blog about chips, broadband and the internet of all the things.